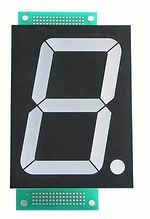 Sometime ago a friend challenged us to build a 6 foot digital clock - just like the alarm clock next to your bed. Well, because of scaling issues, 6 foot was a bit too expensive. Instead, we are going with a 2 foot clock. I'm not entire sure about the end size, but you get the idea. And just to be geeky, let's use GPS to snag the time with 100ns accuracy. The control system is fairly straight foward. Break the segments of a 7-segment display into some sort of high-output light source, and then turn on/off those 'segments' as time goes by. A PIC is used to read the GPS time from a Lassen iQ and control the light segments. Here is an example of the customary 7-segment display. We aren't going to copy this directly, but close. We need to use something to illuminate each segment of the display. How about a light bar. What's a light bar? Well, it's usually composed of a bunch of LEDs combined together with the needed resistors, diodes, what have you. 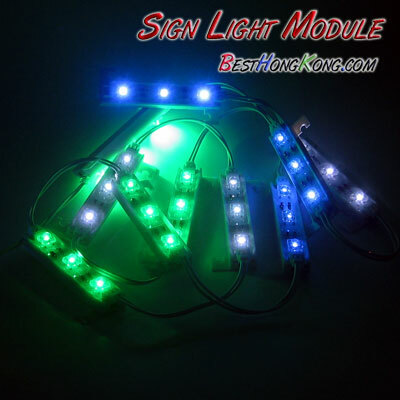 We could build our own, but I'm lazy and [Best Hong Kong] has something called a Sign Light Module that looks like it could do the job really well, for only $2.39 a piece! That's cheaper than I can put a stick together, so I put 50pcs on order. We'll see how they look when they come in. 18:88 will be displayed worst case. To make the clock slightly larger, we are going to use two light 'sticks' for each segment. Each stick looks like it's about 6" long, which will make a segment aprox. 12", which whill make the number height ~24" overall. Each dot in the ':' will be made out of one stick (6" tall). This may look a bit odd, only time will tell. Quick math : Each stick is 3 LEDs. Each Piranha LED is 20mA according to the website (I don't trust the Hong Kong Website very much, but we'll assume). So each stick is 12V @ 60mA. 50 sticks * 60mA = 3A @ 12V. This is a bit juicy for a wall-wart. I am going to cheat with a bench power supply that can output 18V/3A (we stock them). 3A is really the worst case scenario. We only have 48 sticks (not 50) and 10:08 seems to be the real time with the most number of segments lit (44 sticks turned on). We obviously should never see a time of 18:88. At 10:08 we'll need 44 * 60mA = 2640mA = 2.6A. Not too horrendous. The control board will need some power as well. 5V for logic, 3.3V for GPS. But the overall consumption will be peanuts compare to the lighting. Probably under 50mA for the control board. Who wants to set the real time when we've got GPS to set it for us?! :) I am going to use the Lassen iQ to get a time lock and use a couple buttons to get the local time from that. ToDo : It's possible to reduce the number of channels by multiplexing. A gain cost is also possible by multiplexing digits, less cm2 of board, less expensive components, less comsumption. 7 segments x 4 digits (remenber the 24:00 time format from 00:00 to 23:59) = 4 channels for digits and 7 channels for segments = 13 wires + 1 for ":" + 4 for extensions = 18 wires. Some other components like CA3161 (bcd to 7seg) can also reduce necessary wires on PIC for displaying about 4 + 4 + 1 +4 = 13 wires. Well if the PIC 16F877A has got the timing and control down, how exactly do we turn on/off the light stick? 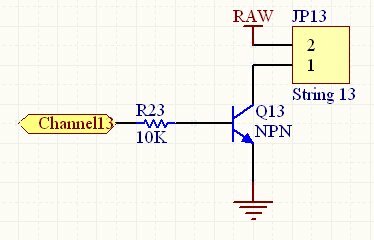 Since the sticks only pull 60mA, we can use cheap BJT transistors. Let's go solid state! Many itty-bitty SOT-23 SMD BJTs can handle up to 1A with a max input of 40V. The maximum power output is 350mW though. Luckily, when forward biased, the MMBT2222 has around 0.5V drop. While this should work, it's going to leave a bunch of connections with one pin 'hot'. A better design would probably utilize a PNP connected to RAW. Ehh - no big deal. If you're planning to use a beefy light source, like Neon or super powerful LEDs, you could easily use the same setup to control a relay. Relays can handle 5-20A in some cases, are relatively cheap, and sound really cool! The only problem is they are big. 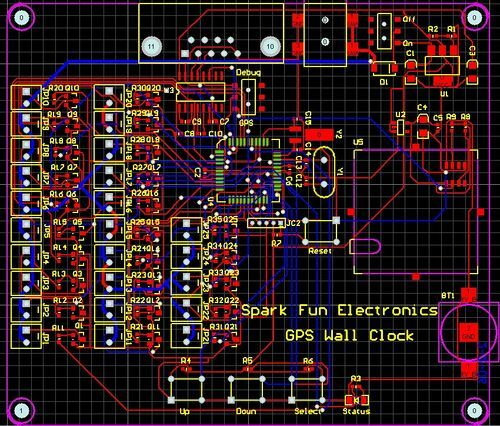 And for this project, we wanted a relatively small control board. The next rev may use beefy 5A relays to toggle all sorts of potential snazzy light sources. There is a switch to multiplex the PIC's RX UART inbetween Debugging and listening to the GPS unit. Be sure to use Port 2 on the Lassen iQ if you want NMEA output (4800bps by default). Nothing at the moment. We have to wait for all the parts to come in. Should be about 4 weeks. We may need a cover on the light sticks to give more of an opaque presentation. TBD. FP Name: All sorts of FPs used. The Spark Fun Wall Clock is so big, it is now listed at "Registry of Giant Digital Clocks". Congratulations! This page was last modified on 7 August 2009, at 07:51. This page has been accessed 141,028 times.